Order your Android Radio App for your SHOUTcast or ICEcast server. We will create your app and we will publish it at Amazon Appstore. 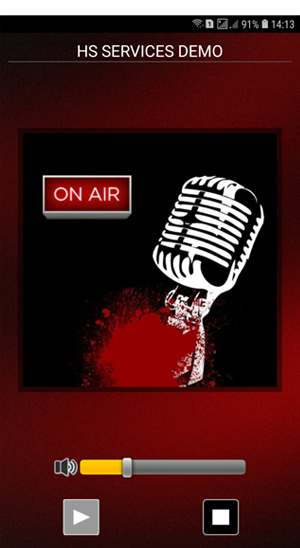 You and your listeners can download this app at Android Devices and listen to your Radio Station. If you like to customize your app, using your images for background and logo, please submit a ticket and upload an image with size 1080px X 1920px for background and an image with size 512px X 512px for logo. Ads Free or you can use your AdMob account to monetize your app. A player for your radio station on Android Devices. To install this demo app or your Radio App at your Android Device, you must first install the Amazon Appstore App for Android.